Because your dog did not ask to be here, it must be fun for the dog and handler or behavior will not be shaped. "ONLY POSITIVE NEVER PUNITIVE TRAINING METHODS ARE USED"
Our training methods are always positive reinforcement, to shape a positive behavior. We feel that punitive methods tend to weaken the bonding process that is fundamental to the dog/trainer relationship. Praise, food and clickers are used. 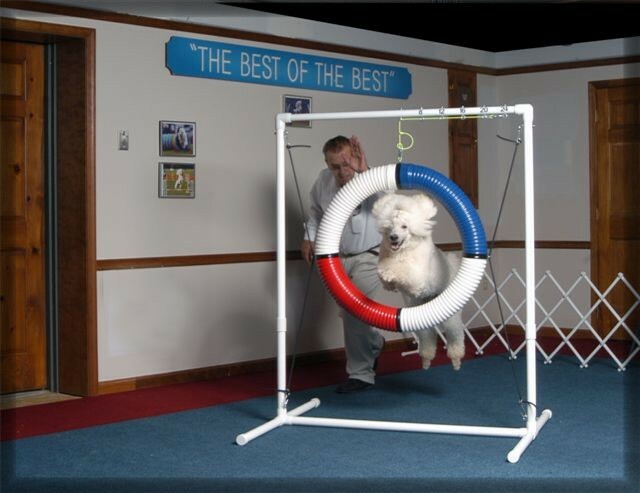 It must be fun for both dog and trainer or no real learning takes place. We believe that our facilities are the best in the tri-state area. The indoor facility is fully matted with state of the art shock absorbing non-slip rubber flooring The training center is 5,000 square feet, well lighted, heated and air conditioned. There are so many reasons; swimming is a non-weight bearing activity. The dog will build muscle without overtaxing joints and bones. The water temperature is kept warm. This is soothing and relaxing for the overall wellbeing of the dog. Our pool water is pH-balanced with mineral additives to promote healthy skin and coat. Swimming improves flexibility and range of motion. Cardiovascular health is as important in our dogs as it is for us. A 15-minute swim is equivalent to a 1-mile run. WHAT DOG SHOULD BE SWIMMING? Show dogs; Obedience dogs; Agility dogs; Frisbee dogs; Fly ball dogs; Freestyle dogs; K-9 dogs; Tracking dogs; Therapy dogs; Retrieving & Hunting Dogs; Even couch potato dogs. We all have those moments when the reality hits us: More training maybe needed!